When planting basil, you can sow the seeds directly into your garden or you can grow your own seedlings in small containers and then transplant them into your garden when they are a few inches tall. 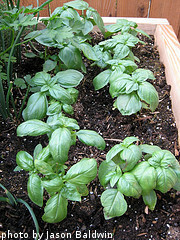 Basil thrives in nutrient rich soil, like topsoil or potting soil. We sow our basil seeds directly into our garden, but first we mix in a good bit of composted manure. We typically grow 3 basil plants per person in our family. This gives us plenty of basil to eat fresh and to dry and/or freeze. Many people prefer to grow basil in containers because they are attractive plants that add a wonderful aroma to a deck or patio. It's also much more convenient to harvest basil from a container rather than putting on your old shoes and trudging out the garden just to pick a few leaves. 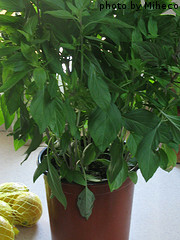 Begin by selecting the variety of basil plant you want to grow. Purchase the appropriate seeds from you local garden center or seed catalog. Nowadays, most garden centers also sell basil seedlings. They are more expensive - usually about $2 for a 3 inch seedling, but are a good way to get a head start. The big disadvantage to purchasing basil seedlings is the lack of variety. Most garden centers only carry one or two different varieties of basil seedlings. Depending on the climate where you live, planting basil seeds in containers is usually done 6-8 weeks before the last expected frost in your area. That way, when the seedlings are mature enough for transplant, the weather outside should be warm enough. If you plan to grow basil in containers, you can go ahead and plant the seeds directly in these containers. Choose pots that have appropriate drainage holes and buy good quality top soil or potting mix. Fill the pots with good soil to within an inch of the top. Poke shallow holes in each pot with your finger. The holes should be about 1/4 deep and spaced evenly. Drop a seed into each hole and cover with soil. Water the seeds in well and place the container in a warm spot in your home that gets as much sunlight as possible. The seedlings will germinate in about a week. When the seedlings develop 4 leaves each, thin the plants to 4 inches apart, keeping the strongest plants. When the weather warms enough and all danger of frost has passed, put the containers outside in a spot that gets 6-8 hours of direct sunlight everyday. 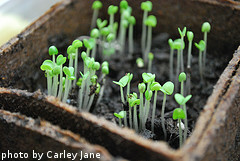 If you want to transplant your seedlings into a traditional garden, it's best to plant basil seeds in flats. These are plastic trays sectioned up into several very small containers. Fill the flats with top soil or potting mix. Poke 2 holes in each section about 1/4 inch deep. Drop the seeds in the holes and cover with soil. Water the seeds in thoroughly. Place the flats in a warm location that gets plenty of sun. When the seedlings develop 4 leaves each, thin to one plant per section. When the plants reach 3 inches tall, they can be transplanted into a larger container or into a traditional vegetable garden. Dig a hole about 6 inches deep and 3 inches across where you want to transplant your basil, be it in the garden or a container. Remember that your basil plants need 6-8 hours of direct sunlight everyday to thrive. If planting basil in a traditional garden, the plants need to be spaced at least a foot apart within the row, with at least 18 inches between rows. Backfill the hole with loose soil until it is only 2 inches deep. Carefully remove the seedling from the flat, remembering to get as much of the root ball as possible. Place the seedling in the hole you dug and cover the root ball with fine soil. After transplanting the basil seedlings, water them in well. If you are planting basil seedlings in a traditional vegetable garden, make sure that the soil is well tilled down to a depth of 8 inches. 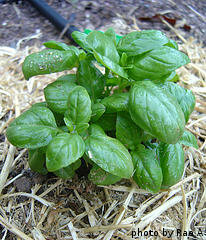 If you want to grow organic basil, work some compost or well rotted manure into the soil when tilling. Now that you're done planting basil, it's time to think about watering and fertilizing your plants.